It’s been a while since my last flight because I finally took the plunge and got PRK (like LASIK), and I have not turned back. My vision was so bad I could not see the big E on the chart, and now I’m seeing 20/25 uncorrected. There is still some healing and potentially an adjustment to be done, so by this time next year I hope to be seeing a very crisp 20/20. FAA requires that you see at least 20/40 uncorrected to pass a Class 3 medical, so I got my forms signed off and I’m ready to go! I needed to do a few things before I could just go nuts again. First, I needed to get my Biennial Flight Review done. This review is mandated by the FAA to include at least one hour of ground instruction and one hour of flight instruction. My flight instructor grilled me on the ground, and frankly, I learned a few things. For example, in a Class G airport, I could do touch & gos with a 1,500ft ceiling. Never thought about it that way because with clouds 1,500 off the ground I typically stay home. But of course, I couldn’t make it that easy. NOOOOO. I decided to also get checked out in a new aircraft at the same time! 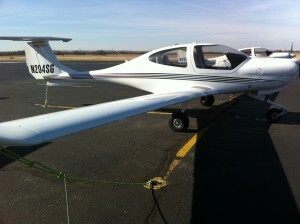 The Diamond DA40 is the bigger brother of the DA20 that I have some hours in. But it doesn’t stop there! This plane also had a Garmin G-1000 glass cockpit, autopilot, AND a constant speed propeller, none of which I have ever flown before! Talk about making something that should be relatively routine a royal challenge! Look at that beautiful glass! The plane looks like its younger, sporty brother, but it sure does not feel like it. 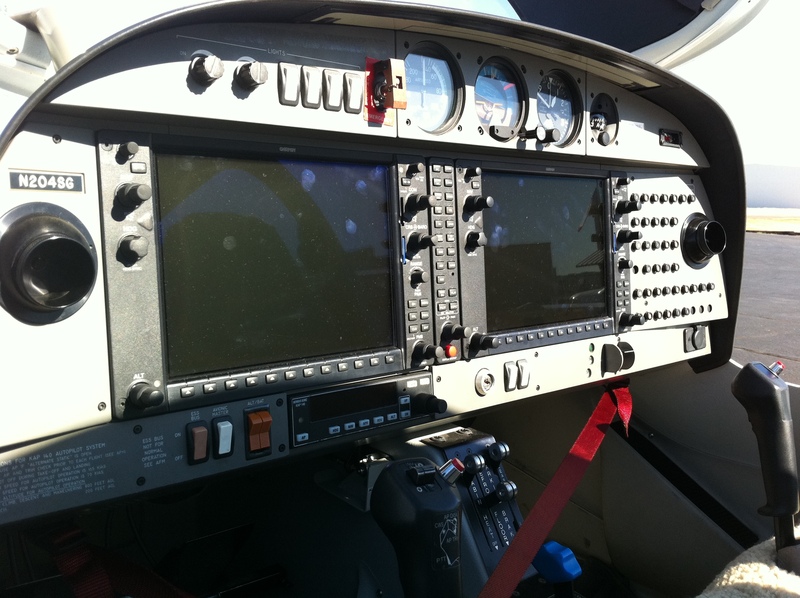 From the minute you sit down in the seats, you can tell that this aircraft is a well maintained, sporty little guy. And really, not that little! The useful load is comparable, if not better, than many of the 172s I have flown, and it cruises faster with similar fuel consumption! That glass is BEAUTIFUL. I found the interface very intimidating at first, but after working it a bit, I really love everything about it. I found that it was easy to monitor engine performance, and easy for navigation. It even has collision avoidance built in! The constant speed propeller was another fun difference. It was almost like driving a standard transmission, but without hard/fast gears. After flying it and taking diligent notes on the ground, I am confident I can master this method in a very short period of time. Autopilot was AWESOME. Holy moly. I could program in a course into the G-1000, engage the autopilot, and that’s all she wrote. Very cool. The last thing that was interesting was the amount of travel that the control stick had to do in order to complete my round out and flare for landing. It caught me by surprise. Still much lighter touch than a traditional yoke, but definitely quite a bit of travel to flare compared to the rest of my experience in flight. Overall, LOVED flying this plane. Can’t wait to go back up! This entry was posted on Tuesday, December 21st, 2010 at 9:51 am	and is filed under Flight. You can follow any responses to this entry through the RSS 2.0 feed. You can leave a response, or trackback from your own site.